Lesson number one: Never go to the principal's office no matter what your age. There's always trouble brewing. Last year I visited Rey Mayoral, principal at Novato High, to change my son's class and he asked if I'd help some of his students resurrect a garden that was started five years earlier by science teacher, Craig Kodros. I wasn't up for more volunteer gigs but then I met the keeper of the garden, Mary Buckley, who was a senior that year, and I was instantly smitten by her grace, intelligence and eco-enthusiasm. Together we started 'the new and improved garden club'; where a dozen students would meet at lunchtime once a week to plant, weed, sow seeds, spin compost, make bouquets of wildflowers or harvest organic greens and tomatoes for teachers and staff. Students could then earn community service hours (and score some extra credit points with teachers). The next school year, Mary graduated but in came her determined younger sister, Tori Buckley, to take over 'Garden Club.' She and new co-president of the garden club, Teya Neff instantly got us a Facebook page and a new, strong, highly motivated, mostly female garden crew. These students are my superheroes. Nothing deters them. Worms, spiders, muddy shoes, hard dirt? No problem. They even dug out an entire 5-year-old diseased tree, stump and all, and carried it high over their heads like a lumber crew, to the school dumpster, during their short lunch break. One afternoon, I mentioned that my dream was to paint the 72- foot gray garden wall so that in the winter, when there are few flowers blooming, the school garden still would look decent. "C'mon, I'm the dirt diva. I need you peeps to make ME look good!" I lamented. Luckily, Jensen Neff, a 10th grader at Marin School of the Arts at Novato High and a visionary member of the garden club was on the same page and stepped up to take charge. "Ever since I was in sixth grade I've wanted to paint something that would add to the beauty of a school," she told me. Done and done! Goodbye boring wall! All we needed was someone to go to the principal's office to get approval. There was no way I was going back there... Instead, I sent the children. Neff and fellow art student, Gabi Borges spent the next week drawing a rough, colored sketch on paper to show him. "After lots of worrying about if the mural project would be approved, I found that once you have an idea about how to add to the beauty of a place, it's very easy to convince people to let you get started, "shared Neff. "Fortunately, Principal Rey Mayoral was very supportive and the proposal to paint the wall was quickly approved." He simply asked to see a final drawing before painting began. Two dauntless women sprouted up to join the Sunflower Mural project: writer and garden teacher, Kirsten Neff and muralist and art teacher, Laurie Marshall, founder of www.unitythroughcreativity.net. The two began working out logistics and gathering supplies on not a shoestring budget but a baby earthworm budget, as well as supervising the students in sketching to proportion, graphing, chalking and choosing colors. More and more drafts were tweaked and refined by the students in order to gain Marshall's endorsement and get the green light to actually begin painting. Marshall has taught art and painted murals for over thirty years so she was a hard sell. This was a challenge. Especially for me because I have no patience... But, the girls persevered and by early summer they were outlining sunflowers, with chalk, across that long, boring grey wall. "We choose Sunflowers for the mural theme because they are captivatingly beautiful, in all their different shapes, colors and sizes, " said Jensen Neff. "That's how we see students at Novato High. We think our school is a great place to be yourself, whether that "self" is artist, jock, nerd, cheerleader... or none of the above. Also, sunflowers are so powerful that they were used to help clean up radiation from the soil and water after the nuclear disasters at Chernobyl in Russia and Fukushima in Japan after the tsunami. We like that something so small (in the scheme of things) and unassuming can be so powerful and surprisingly able to solve some major problems. That is how we like to think of ourselves as students. We might surprise you with what we are capable of and what kinds of problems we might solve." Over the month of August, students (Tori Buckley, Annalise Dowd, Rubye Fangmeier, Tatum Figone, Sophia Grimani, Charlie Jones, Teya and Jensen Neff, Lexi Omholt, Evelyn Power, Sarah Sekulah and Vanessa Silva) showed up in shifts to paint. Even in the dry, August heat, there was always a student alongside Marshall, balancing a paint can on top of an 8-foot ladder, painting sky background, mountains and hillside or exquisite sunflowers. Watching Marshall's face as the mural progressed I got the feeling that if this were Laurie Marshall's world every wall of every school would have a gargantuan, vibrant mural-with-a-message stamped on it. "Gardens and art give us hope: hope for growth, imagination, possibility, joy, fellowship," she told me one day (after she told me to be patient with the painting). "We are celebrating the power of soil, sun, water, seeds and care." What was the biggest challenge of the sunflower mural project? "The main challenge was at the beginning, "Neff shared. "I had to graph my original sketch so that it was proportional to the size of the 72-foot wall. Once the graphing was done on the paper, we used chalk and translated that to the wall. After that it was all relatively easy." 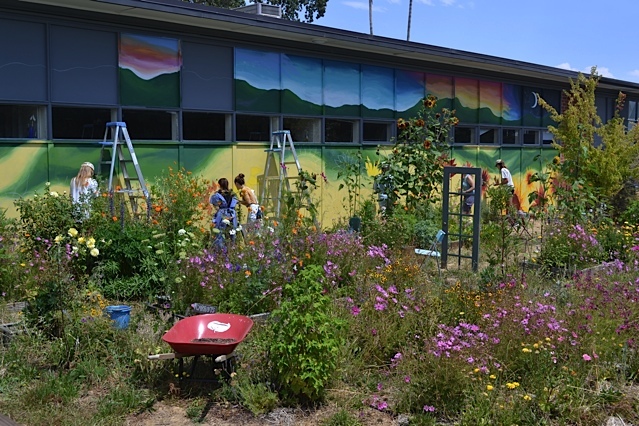 Neff and fellow art students involved in the paint project hope that the Novato High organic garden and the new mural will show other students that it's possible for everyone to put a little color and beauty anywhere they choose, and that their efforts can make a difference. "Sunflowers look like the sun and have traditionally been a symbol of light, power, warmth and optimism, all great things to wish for a high school garden and for young people in general," she said. "Gardens and murals are similar to sunflowers. If you put some time into taking care of them, they give a whole lot back." Photo Courtesy of Kirsten Neff. This was the school garden over a year ago when we began resurrecting it. All we did was add compost, compost, compost! Feed the SOIL with life (not chemicals!) and everything else will follow.